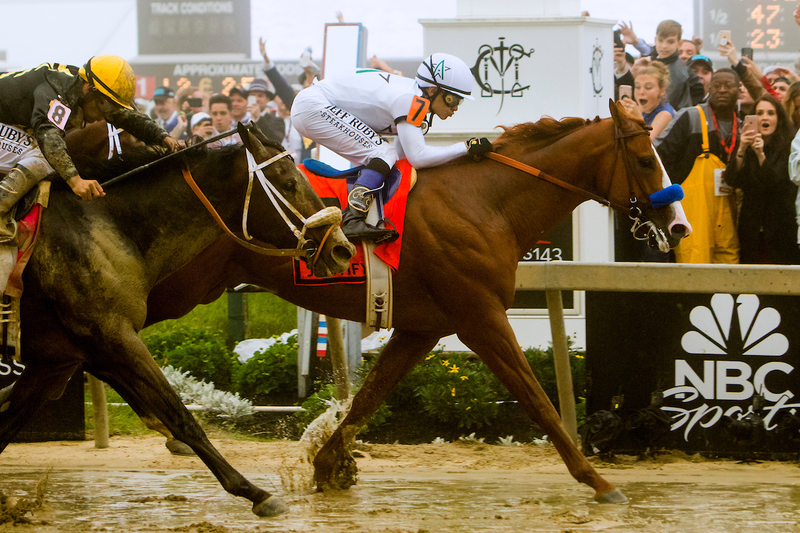 Home / Preakness 2018 / Preakness 2018 Recap – Justify Tops Tickets – Belmont Stakes Next! On a day that felt a lot like it did two weeks ago in Louisville, with cloudy skies and persistent rain, Justify emerged from the fog in mid stretch working on disposing of Good Magic who engaged him throughout and then the Baffert colt mustered enough reserve energy to hold off the late-charging Bravazo as he hit the wire for the hard-fought, narrow victory. All things considered, this was another huge performance by Justify who did all the work up front but prevailed, narrowly, in the end. The rain soaked track actually had a decent bottom to it which propelled front runners to the winners circle in ridiculously fast fractions and final times all day long. So, while Good Magic took it to Justify for over a mile, the track surface definitely favored his forwardly placed position. The big question now is…do we have a potential Triple Crown winner in the making? Hey, at least we have that exciting possibility in play so let the speculation and debate over the next 3 weeks begin! As the Belmont Stakes field comes together we’ll begin our early analysis and provide initial insights well before the big event. 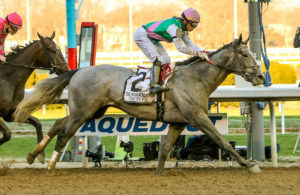 We also have new criteria added to the Belmont Stakes Super Screener this year which will continue to add more precision in assessing each horse’s potential in this final leg of the Triple Crown. The Screener was heavily convicted that despite all speculation and concern about the minor foot bruise sustained after the running of the Kentucky Derby, Justify earned by far the highest Super Screener score resulting in being the lone win candidate for this race and nearly all suggested wagering strategies reflected this conviction. With each passing day, Bravazo’s stock rose as he came out of the Kentucky Derby in great shape and was looking particularly strong in his morning gallops leading up to the Preakness. His trip in the Kentucky Derby also came back more impressive than it looked thanks to the analysis provided by my colleague Mark Midland who noted how much extra ground Bravazo covered in that race. 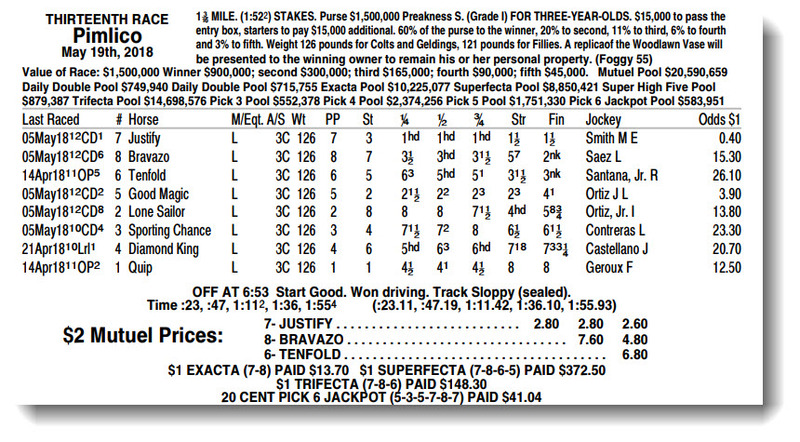 With the prospect of a sloppy track at Pimlico becoming more certain, Bravazo became a strong “under” play. As it became clear the Pimlico track would come up sloppy and favor those with the ability to stay relatively close to the pace, Tenfold moved up as a strong bottom of Trifecta and Superfecta player and was used as such in suggested wagers. Trainer Asmussen was also tearing it up in leading into the Preakness (and continued his dominance on Preakness Day) adding more confidence. Despite Justify winning the race at odds of 2-5, the Super Screener suggested wagering strategies focused on narrower tickets primarily singling Justify in first. We used Bravazo heavily in 2nd and 3rd and used Tenfold enough in 3rd and 4th to result in decent Exacta, Trifecta and Superfecta scores. For weekly subscribers to the Super Screener they were provided with recommended Pick 4 tickets. We deployed the wagering strategy of singling Ax Man in the 3rd leg of the Pick 4 and Justify in the final leg in most tickets. While the first two legs of the Pick 4 came back chalky as well, there were enough $2 and $4 Pick 4 tickets to help make up for the modest Pick 4 payout. On to the Belmont Stakes! It is always great to have a Triple Crown contender in play thereby extending the excitement of the Triple Crown for another 3 weeks. Bravazo and Tenfold will probably go on to the Belmont Stakes and top quality horses that ran in the Kentucky Derby such as Audible, Hofburg and Vino Rosso have been cooling their jets and come into the Belmont with that added two weeks of rest. Given the narrow margin of Justify’s win in the Preakness, this may entice others including trainer Todd Pletcher, to take another crack at Justify on the second Saturday in June. We’ll also see the deep closer Blended Citizen enter the Belmont Stakes off that recent win the Peter Pan Stakes. All and all, this year’s Belmont Stakes is setting up to be almost as intriguing as the Kentucky Derby and the prospect of a fairly large field will make this a particularly attractive wagering opportunity…and Justify is certainly not a lock to win this race. Our work on the Belmont Super Screener begins today and we’ll be ready with an early release the week of Memorial Day. Thank you very much for your continued support of the Super Screener and we look forward to a very successful outcome on Belmont Stakes Day! 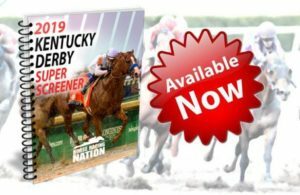 ← Previous Story Preakness Super Screener Now Available! I used strategy #2 and #10 using the medium priced wagers and cashed out $737. I took the strong stand against quip also, as other experts had him in the mix. Thanks for another good day using the screener. Can’t wait to cash big with a comma in the Belmont. From the first time I used a Super Screener product I’ve been in the black! Over the years I’ve used several prognosticators with varying levels of success, but Super Screener is the only one that has a proven track record. I’d like to give a special shout out to Candice who has done an excellent job helping me along the way over the years. Keep up the good work, looking forward to the Belmont Stakes! Been a member of HRN past 5 years and am overly satisfied with your expertise resulting in a usual payday. I do not win on every ticket, but my winners supersede my losers each year. Your family of workers are real professionals.